Is the tide turning for trade dress decisions in Brazil? Interflora v M&S: are the days of survey evidence over? The Court of Appeal of England and Wales has handed down judgment in Interflora Inc v Marks & Spencer PLC ( EWCA Civ 319). This decision – the second judgment of the court in this case on the admissibility of evidence from witnesses identified through surveys – seems to make it even harder to adduce survey evidence in trademark infringement cases. In Fédération Cynologique Internationale v Federación Canina Internacional de Perros de Pura Raza (Case C-561/11), the European Court of Justice (ECJ) has held that that a ‘third party’ under Article 9(1) of the EU Community Trademark Regulation (207/2009) includes the owner of a later registered Community trademark (CTM). The Intellectual Property Laws Amendment (Raising the Bar) Act came into effect in Australia on April 15 2013. The most important change is the introduction of a new opposition procedure. Google has revised its AdWords trademark policy to lift a restriction on using trademarks as keywords in a number of countries. Starting April 23 2013, it will no longer prevent advertisers from selecting third-party trademarks as a keyword in advertisements targeting Australia, Brazil, China, Hong Kong, Macau, New Zealand, South Korea and Taiwan. This means that Google’s AdWords trademark policy is now harmonised worldwide. The Canadian government has introduced Bill C-56 – the Combating Counterfeit Products Act – which proposes significant changes to the Trademarks Act and Copyright Act. The bill aims to “protect Canadian consumers, Canadian manufacturers and retailers as well as the Canadian economy from the health and economic threats presented by counterfeit goods”, and also provides for the registration of non-traditional trademarks. The European Commission has published its proposals to amend the EU Community Trademark Regulation (207/2009), the EU Trademark Directive (2008/95/EC) and EU Regulation 2869/95/EC on the fees payable to the Office for Harmonisation in the Internal Market (OHIM). The proposals are designed to “make trademark registration systems all over the European Union cheaper, quicker, more reliable and predictable”. 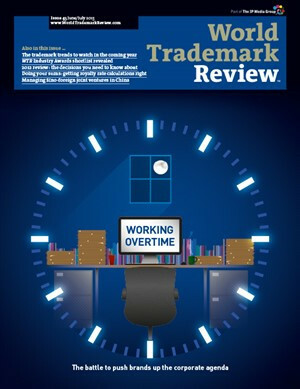 The Trademark Clearinghouse – the rights protection mechanism built into the Internet Corporation for Assigned Names and Numbers’ new generic top-level domain (gTLD) programme – has commenced operations. United Kingdom The UK Intellectual Property Office has launched a consultation to obtain stakeholders’ views on the appropriate procedural changes for the introduction of a fast-track opposition procedure within the Trademark Tribunal. The consultation outlines proposals for the fast-track procedure and seeks views on the introduction of a refundable appeal fee for inter partes appeals to the appointed person. The deadline to submit comments is May 17 2013.